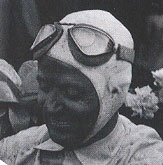 His brother Emilio who was racing för the Alfa Romeo team died 1940. During the war Villoresi was held as a prisoner of war. After a crash in 1956 in a sports car race where he broke his leg very badly his family begged him to retire which he did. But he came back for the 1958 Acropolis Rally and won it.